I admit, that this past Saturday, I woke up at 6:30 AM so I could watch the Royal Wedding. By the time I turned it on, Meghan Markle was just arriving and getting out of the car - perfect timing! The whole thing was so magical and has been making me happy ever since. I think I've literally looked at every single photo that exists on Instagram. I've been a big fan of Suits since the beginning of the show (and have always been a HUGE fan of Prince Harry) so needless to say, I think they are the perfect match and they are both flawless IMHO. Everything about the entire day was amazing - her dress, Harry looking SO happy, the carriage ride, Meghan's mother - the list goes on. I'm usually not one to obsess over celebrities, let alone someone else's relationship, but it seems like the news and lots of stuff going on in the world right now has been so depressing. The Royal Wedding felt like a bright light of joy and love and I haven't been able to resist paying attention to all of the details. Did you watch the Royal Wedding? What did you think? I'm not a big tequila drinker - I do love margaritas but when I'm out with Pat or friends I normally gravitate to wine, or gin cocktails. Tequila has such an intense flavor and sometimes it overwhelms me! BUT one of my all time favorite drinks is a paloma. If you haven't had one before, it's similar to a margarita but it's made with grapefruit juice instead of the sour mix. And grapefruit juice pairs SO well with tequila. I wanted to make a fun cocktail for Memorial Day weekend so as soon as I remembered that I have a half a pound of dried hibiscus flowers sitting in my pantry I knew I had to use them. This cocktail is refreshing, flavorful and so easy to make. Happy drinking! Line the rim of a tumbler glass with salt. I do this by wetting the rim and then dipping it in a plate of salt. 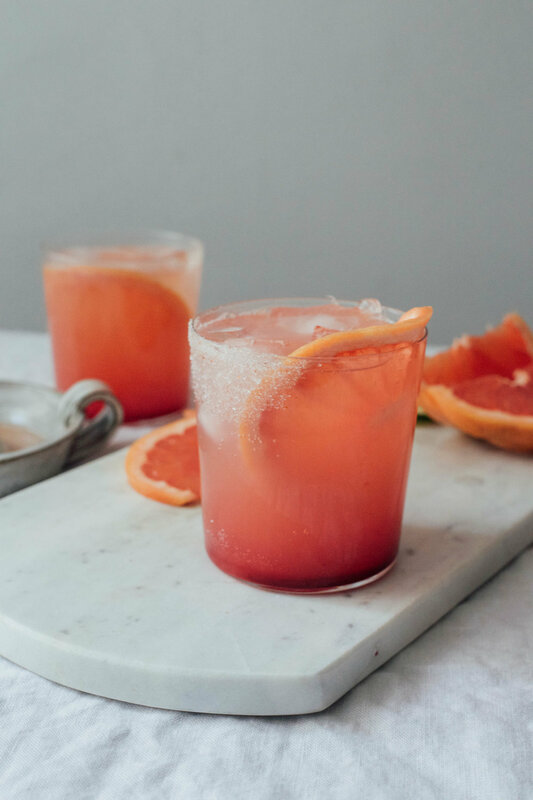 In the same tumbler, add a slice of grapefruit and fill the glass with ice to the top. Add in 1 oz. hibiscus syrup, followed by 1/4 cup grapefruit juice. Add 1.5 oz. of tequila (I used a silver tequila because I didn't want to have any color) and top with grapefruit juice and enjoy! In a small saucepan, simmer all the ingredients until the mixture has thickened and is bubbling. Let cool and pour into a glass container, using a mesh sieve to strain out the hibiscus leaves. Let cool to room temperature or in the fridge.